The crisis in Greece now has the full attention of investors around the world -- and they don't like what they see. European markets were slammed Monday, with both the German DAX and French CAC falling more than 3.5%. Portugal's stock market was down about 5%, while Britain's FTSE fared better, shedding only 2%. European bank stocks were particularly hard hit. Spain's Banco Santander (BCDRF) dropped 6.7%, while French bank Credit Agricole (CRARF) lost 5%. "While Greece is the weakest member of the euro and might not have the largest economy by any means, the global implications to Greece failing to repay its debts remain largely unknown and this is why worldwide indices will continue facing downside pressures," noted FXTM chief market analyst Jameel Ahmad. Related: Which countries are most exposed to Greece? Greek shares and bonds were not trading Monday because markets were shuttered after officials said Greek banks would be closed until July 6. Asian markets finished lower on the day, led by Japan's benchmark Nikkei index, which declined by 2.9%. Australia's ASX All Ordinaries was down 2.2%, while Seoul's KOSPI Composite lost 1.4%. The euro initially tumbled against other major currencies, losing 1.6% against the Japanese yen. But by late Monday it was 0.7% firmer against the U.S. dollar. Government bond yields rose in Italy, Spain and Portugal but the move was relatively modest, and all three countries are still able to borrow more cheaply than a year ago. The Dow shed 200 points late Monday morning, the S&P 500 fell 1%, and the tech-heavy Nasdaq lost about 1.25% in early trading. The trigger for the rapid escalation in the crisis was the Greek government's decision late Friday to pull its negotiators out of bailout talks. Prime Minister Alexis Tsipras slammed a draft proposal from Europe and the International Monetary Fund, and then said he would put it to the Greek people in a referendum on July 5. Banks in Greece will not open on Monday, and account holders will face tough limits on what they can withdraw from ATMs. 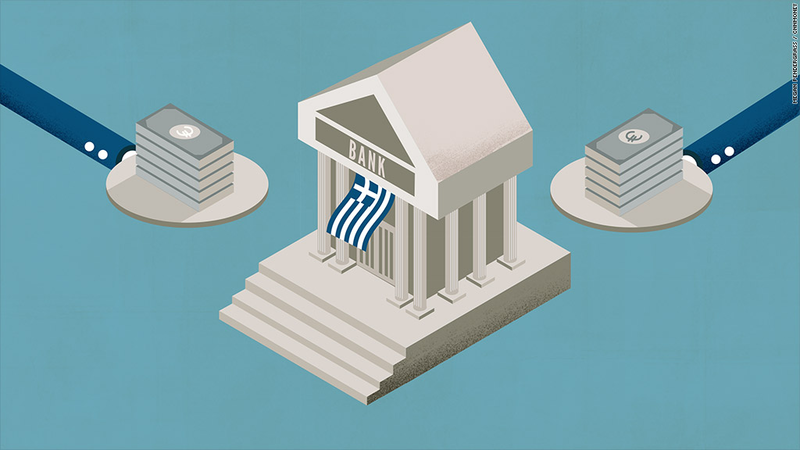 The curbs on banking imposed by Greece on Sunday are known as capital controls, which are used only at times of extreme stress in a banking system. Greece faces a critical deadline on Tuesday, when it must make a loan payment to the IMF. The country looks almost certain to default on that payment. -- Mark Thompson and Sophia Yan contributed reporting.